Home / Warhammer 40K / Tactics & Meta / Gareth ‘Tank’ Roberts LCO Journey!! 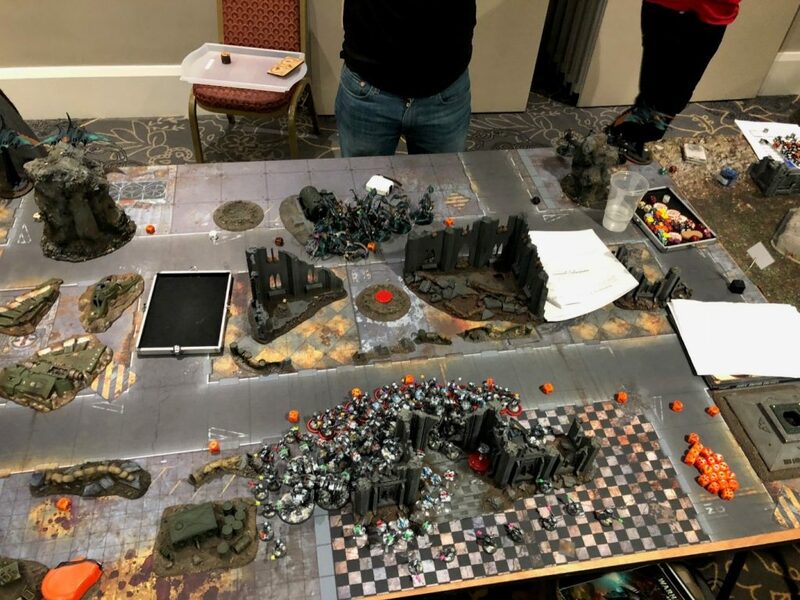 I recently attended the Last Chance Open tournament in Southport using a list concept designed for me by the Glasshammer team using their masterclass service, and Mani asked me if I would share my tournament experience. I recently returned to playing one of my favourite model ranges, the Tau, and to make sure I was spending my cash and hobby time efficiently I decided I’d get in touch with the guys for some list guidance given that they have one of the best UK Tau players on their roster in Alex Harrsion, and unbeknown to me at the time Mani who is now into the fishmen in a big way. Game 1 was a Tau mirror match versus a beautifully painted double Y’varha list. I was nervous setting up for the game as I had not played against Y’varha suits in 8th edition yet, bet knew of their destructive reputation and they were accompanied by a whopping 26 shield drones. The deployment was dawn of war so we both agreed who got first turn would be huge. Luckily I went first and was able to Montka and kill all the shield drones and a Yvarha first turn. He responded by killing all my drones and 2 broadsides, then I was able to Kauyon turn 2 and pretty much table him. Game 2 was against the top European ITC Necron player. 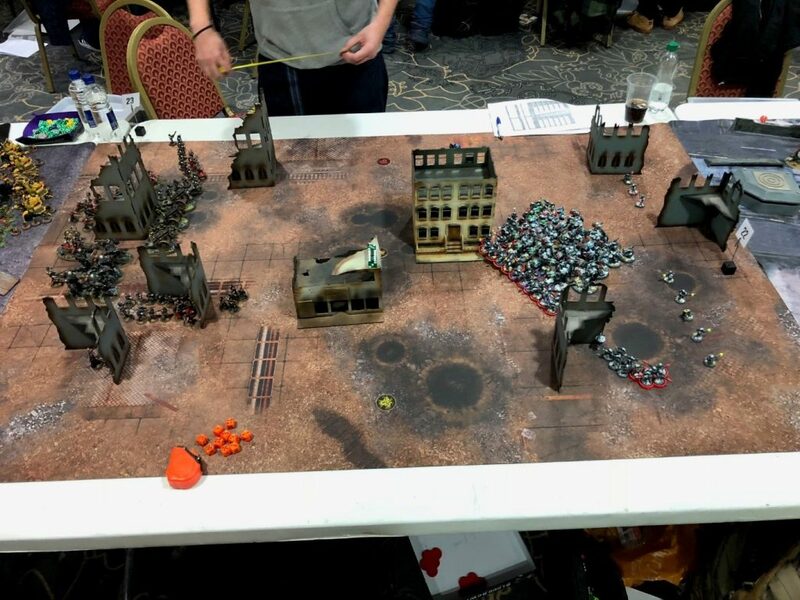 This game was streamed by The Honest Wargamer team so I didn’t take any pictures, but it is available on their Twitch channel along with other games from the weekend if you want to watch. I don’t know a lot about Necrons, other than I had to prioritise the Wraiths and Destroyers. 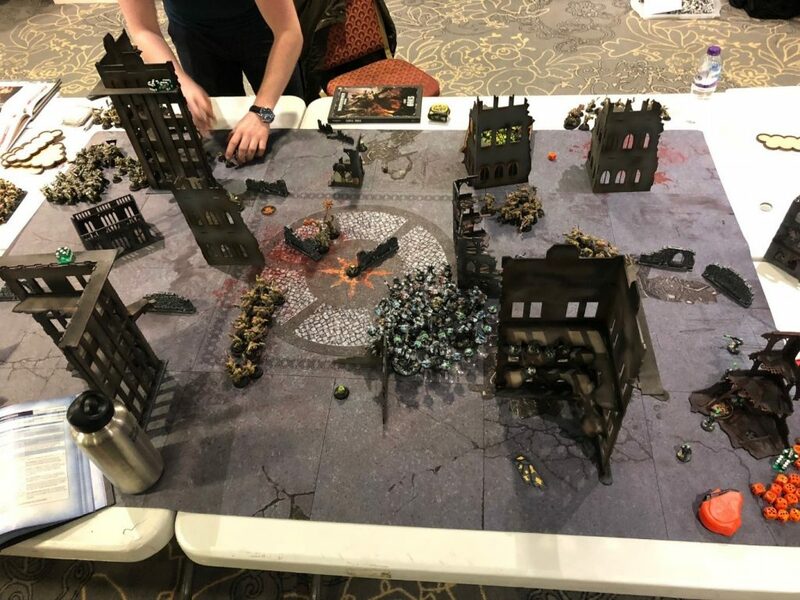 My opponent won the roll to go first, but I was lucky enough to seize allowing me to Montka up the table and destroy 1000pts of Necrons on my first turn. The crippled Necron army could only respond by destroying 20 or so firewarriors in response, then Shadowsun declared Kauyon and there were only 3 Necron Immortals left on the table at the end of turn 2. After two near max wins I was swimming with sharks for game 3, and was paired up with the eventual winner Eric Hoerger with his 8 talos, 3 razorwings and 6 skyweavers list. 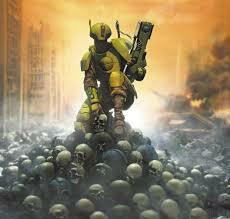 It was pointy dawn of war deployment, he got first turn and the talos just overran me! The Talos moved up the board in a menacing clump, the razorwings made a dent in my shield drones and through a deployment error on my part and good play by Eric he was able to Phantasm, double move and blind charge a corner of my castle in his first turn and tag a unit of Broadsides. I only killed 4 Talos in response, which is good going, but not enough. In turn 2 the remainder of my screen and drones evaporated to razorwing fire and talos assaults, and with all my broadsides engaged in combat we agreed it was time to call it and just talk out the remainder of the game. Game 4 was against what is shaping up to be a classic Orks competitive build; 25 lootas, 90 boys, 3 x 10 kommandos, grots and characters. The game was played on corners deployment. I went first, montka’d and killed 60 boys first turn! Then on my opponents first turn another 20 boys fell in overwatch meaning I maxed out the Reaper secondary in the first turn. My opponent was horrified by the carnage but after a game versus a similar army the week prior at a different event I knew I would struggle to interact with the Lootas on a diagonal deployment with all their shenanigans and that would ultimately cost me the game so I set about trying my best to get as many points as I could out the game. The lootas were tucked right in the far corner, and my opponent threw all his remaining characters, boys and a few units of grots into my castle to move block me from getting in range of the lootas again on my second turn. It paid off for him and over two turns his lootas shot off all my fire warriors and drones, then the broadsides started going down and my army crumbled when the Kommandos arrived by deepstrike. So a 41-22 loss in that one. I find the lootas are very hard to interact with against a good player with their long range, grot shield, deepstrike option and da jump in their toolbox. Their shooting is just murderous. 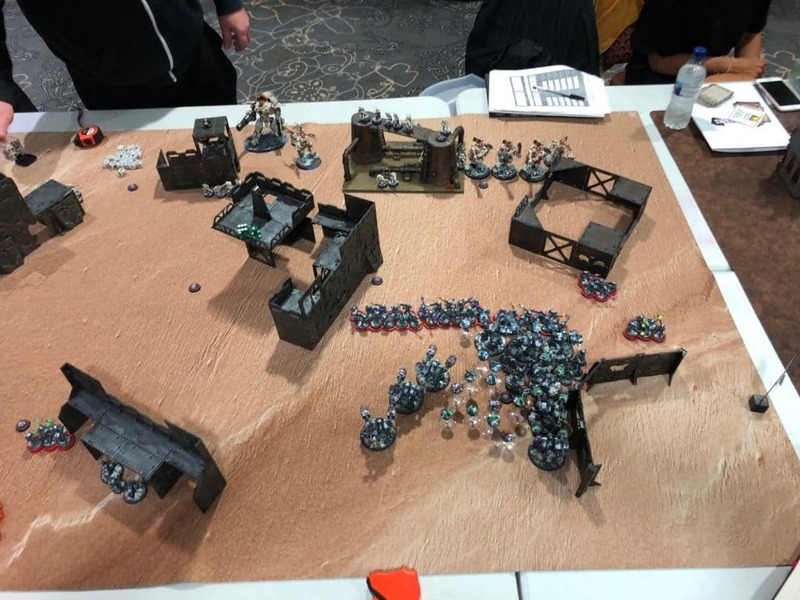 Game 5 was against an Ad Mech and Vostroyan Guard gunline, with his main firepower coming from 6 Kastellan Robots and 6 Plasma Kataphrons supported by Cawl, and 3 Vostroyan thud guns. He went first and I braced for impact as with the new Vigilus book the Kastellan robots can now advance and still do their shoot twice with Wrath of Mars trick! I was as a bit jammy on my dice and managed to only lose all my shield drones and 2 broadsides to the barrage. In my first turn I was able to kill all his Kastellan robots and then the remainder of his damage dealing units in turn 2 – the shield drones and a bit of luck were essentially the difference between the two gunlines and I won comfortably in the end. Previous post: Mani’s Cally List!! Thanks for the write up, it was a good read. How do you think you’ll change the list going forward ? Obviously when the triple broadside list works well its devastating, but seems to have some weakness, ie. the broadsides getting tagged, and likely scoring. I think 9 broadsides while devastating is one small step too far, would you consider losing one unit, and what would you put in instead of them ? More drones and/or a deepstrike option that could help against lootas etc., eg. commander with 3 weapons and a drone controller with lots of gun drones (311pts gets you an xv8 commander, 3 cibs and drone controller, plus 3 x 6 gun drones, 9 str8 and 72 str5 shots). Oh, and Ion Rifles, you’re a man after my own heart ! I think Ion Rifles are really underrated.